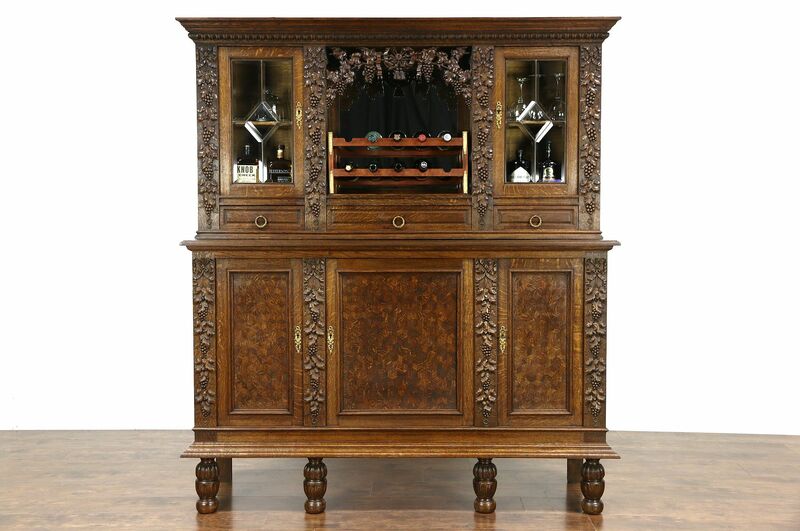 A French sideboard, back bar or wine cabinet from around 1900 has incredibly artistic high relief grapevine carving in solid oak. Upper doors have beveled leaded glass panes, the beveled mirror has a little antique "smoke" to show its age. The top of the base is revarnished for durability, the rest of the finish is very well preserved and original. Waxed and buffed, all that is needed to maintain the warm luster is an occasional wipe with a soft dry cloth. Drawers have solid oak sides with hand cut dovetail joints. Separate keys operate upper and lower doors. Brass hardware is original. The upper section is removable for easier delivery of this historic furniture. Lower doors have a mosaic "cube" design that appears three dimensional. Measurements are 70 1/2" wide at the crown, 20" deep, 73 1/2" tall and the base is 43" high.